EXCLUSIVELY AT NEIMAN MARCUS Sham with watercolor floral pattern. 2" solid velvet flange and cord. Two-piece velvet back with zip closure. Polyester. Dry clean. 26"Sq. Made in the USA of imported materials. 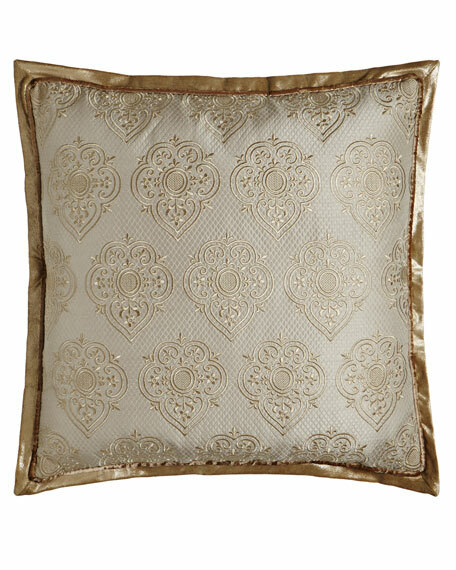 EXCLUSIVELY AT NEIMAN MARCUS Silk sham with raised diamond design front. 1.5" silk folded flange ties at corners. Silk back. EXCLUSIVELY AT NEIMAN MARCUS Silk sham with raised diamond design front. 1.5" silk folded flange ties at corners. Silk back. Zip closure. 26"Sq. Dry clean. Made in the USA of imported materials.